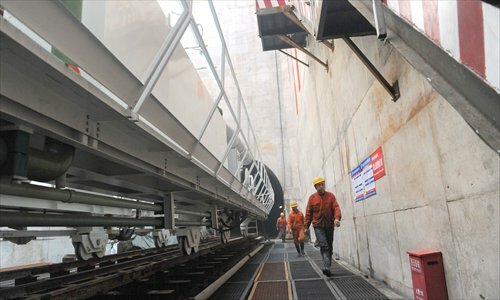 China has approved investment of more than 800 billion yuan ($129 billion) in infrastructure construction so far this year in a bid to stabilize the economy, news portal chinanews.com reported Tuesday. The National Development and Reform Commission (NDRC), China's top economic planner, had approved infrastructure projects worth 884.2 billion yuan as of Tuesday, including the construction and expansion of airports, bridges, high-speed railways, and the improvement of urban transport systems, the report said, citing information posted on the NDRC's website. Most of the projects were approved in May and June, and analysts attributed the accelerated investment to the central government's efforts to stabilize the economy. China's GDP growth slowed to 7 percent year-on-year in the first quarter of 2015, the slowest pace in six years. The National Bureau of Statistics (NBS) is scheduled to release GDP growth data for the first half later this month. Some economists believe China's economic growth will slow to below 7 percent in the second quarter due to slower growth in fixed-assets investment, exports, industrial output and consumption. "We estimate that GDP growth in the second quarter will slow to 6.9 percent, as high inventories of unsold homes are still dragging down real estate construction and affecting industrial output and fixed-assets investment," Wang Tao, chief China economist with UBS, wrote in a note sent to the Global Times on Friday. China's once-hot property market has slowed down since early 2014 with falling prices and sales, forcing developers to slow down their investment pace. Investment in the country's real estate sector grew by just 5.1 percent year-on-year in the first five months of 2015, down from 10.5 percent in the whole of 2014 and 19.8 percent in 2013, according to the NBS. "The central government hopes to support the economy through massive infrastructure investment, partly because investment in the real estate and manufacturing sectors is still weak at the moment," Lian Ping, chief economist at Bank of Communications, told the Global Times on Tuesday. The investment in infrastructure construction is also in accordance with the increasing demand for regional connectivity, analysts said. Lian said the NDRC is likely to approve more high-speed railway projects connecting provincial capitals and big cities, to facilitate business and flow of personnel. For instance, a plan to build a high-speed railway project connecting Hangzhou and Wenzhou, two cities in East China's Zhejiang Province, has been submitted to the NDRC for approval, local newspaper Wenzhou Daily reported Tuesday. The project, if approved, will shorten the travel time on the 270-kilometer route from around three hours to less than an hour. Xu Gao, chief economist at China Everbright Securities, said there could have been even more infrastructure investment so far this year, had it not been for a lack of funds among local governments. However, as China has relaxed rules on the issuance of corporate bonds, infrastructure investment is likely to increase, he said in a note e-mailed to the Global Times on Tuesday. Following the launch earlier this year of a debt-for-bond swap program by the Ministry of Finance, local governments will also have strengthened financing capabilities to fund infrastructure projects, Xu noted. The NDRC also aims to attract more private investment into infrastructure construction by promoting Public-Private Partnership (PPP) projects. It unveiled a PPP project list in May, which includes 1,043 PPP projects worth 1.97 trillion yuan. Lian said the central government is also likely to give further fiscal support to infrastructure projects in the second half, and bank loans for these projects will be increased as well. With a series of measures set to stabilize the economy, China's GDP growth will rise to 7.1 percent in the third quarter and 7.2 percent in the fourth quarter, according to Lian, thus helping China reach its annual GDP growth target of around 7 percent.